Yetunde Meroe (MC ’16) takes her food seriously. As a chemical engineering major, Meroe ties her passion for engineering and industry to a love for food and an interest in social outreach. 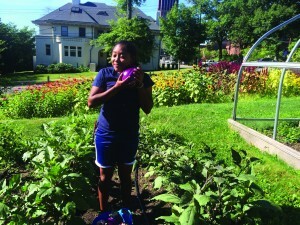 Her work as a Lazarus intern at the Yale Farm this past summer illustrates her desire to unite these diverse fields. “Food is tied to everything in society – you can’t remove it from anything,” she said. Meroe, who grew up in Ghana, plays a variety of different roles at Yale, including Student Manager at the Afro-American Cultural Center and President of the Yale Women’s Rugby Football Club. In her scientific pursuits, she is set on using her engineering background to make a positive contribution in communities similar to her home community in Ghana. 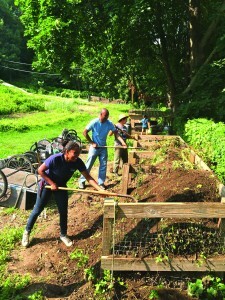 Yetunde Meroe ’16 works at the Yale Farm, where she participated in the Lazarus summer internship. 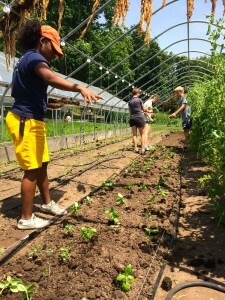 The Lazarus internship, a program that involves working at the Yale Farm, gives students from a variety of backgrounds the opportunity to experience different social, economic, culinary, and scientific aspects of food. Meroe took her summer work very seriously, and realized that she could use engineering to improve conditions of food and agriculture back home. “You get a little bit of everything [through the internship], and it really helped me look at the importance of food in a different way,” Meroe said. During the summer, Meroe participated in a wide variety of food-related activities, including canvassing for free public school meals, visiting public schools to see their food production process, working in an industrial kitchen, and sailing on an oyster boat. She also took classes on cultural economics and soil chemistry. The program was a small group of only six students. “You get to know them very well,” Meroe said. Meroe thoroughly enjoyed her work at the Yale Farm this past summer, and loved getting to know other interns and fellows. Two components of her summer internship stood out to her in particular. “I think the most enlightening part for me was the soil class, and also going to a food depot, which serves Yale, up in Hartford,” Meroe said. The food depot is a wholesale food seller, where large amounts of food are sold in bulk. “In Ghana, we don’t have anything like that. It was interesting trying to envision something like that back home,” Meroe added. In fact, home is never far from Meroe’s mind, just as food and engineering are almost omnipresent in her academic and extracurricular life. She thinks often about the social and economic impacts of food. In her conversations at school, especially in her engineering courses, she pays attention to how different systems or models might work in Ghana. When a new idea is introduced, she always tries to envision it working back home. Meroe’s summer research project focused on improving the soil quality of semi-arid locations, specifically northern Ghana. This gave her additional insight into the potential for new soil engineering systems in her home country. “This gave me that connection more than any other experience I’ve had at Yale. I was really appreciative of that,” she said. Meroe sprinkles seeds in the soil at the Yale Farm. Soil science was a major theme of her summer work. Building off of her soil research, Meroe is considering a thesis involving soil science. “This summer has really made me start thinking about a lot of things I would never have considered before,” Meroe said. “I was so anti-grad school before this summer.” However, she is now applying to the five-year Master’s program at the School of Forestry, from which she would graduate with a master’s degree in Environmental Management. Meroe is further considering a concentration in either energy or industrial systems. Meroe looks back on her internship at the Yale Farm with nothing but positivity. “The best thing is to try different things,” Meroe said. “I didn’t think this summer would be as transformative as it was. It was getting in touch with your food, getting to know where your food comes from. No matter what you think you’ll do in the future, that is a transformative process in itself.” For her, of course, the experience did lead to an ignited passion for using her academic background to make a real difference in the world.